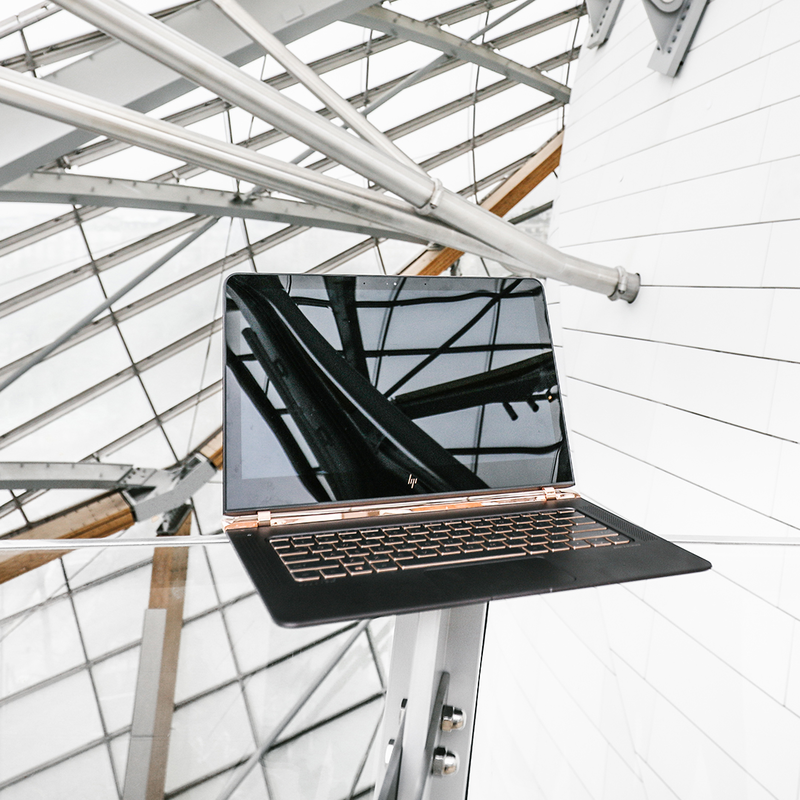 Once upon a time, the most handsome Windows 10 ultraportable you could have was a MacBook running Bootcamp; now, HP wants to offer you an alternative. The HP Spectre 13.3 follows in the premium footsteps of earlier high-end notebooks from the firm, bringing some creativity to Windows computer design that has been sorely missing and now is officially available in South Africa. The device was launched an exclusively intimate event in the North of Johannesburg last night. First impressions are of extreme thinness. In fact, the 13.3-inch notebook is 10.4mm thick, comparable to an AAA battery no less, and tips the scales at about 1.1kg. The lid is a wafer, and the base seems little thicker once the screen is lifted. HP took inspiration from furniture for the Spectre’s hinges, two slender C-shapes that look like they should be delicate but actually glide smoothly open and shut. Doing double-duty of keeping the weight down but also avoiding body flex are CNC machined aluminum for the lid and keyboard deck, and a carbon fiber base. HP continues to eschew the more traditionally-geek-friendly silver highlights for coper and ash-silver instead – the rear section is both particularly shiny and hungry for fingerprints – which may well prove divisive. It looks better in-person, I think. There’s also a new logo, a heavily stylized “HP” on the lid. Previous Spectre series notebooks spelled out the whole Hewlett Packard name, you might recall, but the computing division lost the rights to that in the split late last year. HP tells me it’ll be keeping this new logo exclusively for its more premium models. The dimensions mean most regular ports simply won’t fit in the space HP has to play with, and so – with the exception of a 3.5mm headphone jack – the new Spectre embraces USB-C completely. There are three USB-C ports each with USB 3.0 support, and two of which also support Thunderbolt. The specifications are as you’d expect, for the most part, though the design has forced a few compromises. Rather than a low-power processor, Intel’s regular sixth-gen Core i5 and Core i7 chips are inside, along with 8GB of memory and up to 512GB of PCIe SSD storage. However, there’s no touch support – the touchscreen layer would add too much thickness, HP says – and the IPS screen is Full HD resolution, not Ultra HD. A sufficiently thin 4K panel still isn’t available, HP tells me, though it does throw in Gorilla Glass 4. The backlit keyboard keys have 1.3mm travel – rather than 1.5mm – though in my brief typing test I didn’t particularly notice any slowdown in my pace. HP claims that’s because it pays particular attention to the resistance you feel when you first strike each key and when it bottoms out. Underneath is a glass trackpad, while either side – behind somewhat ornately-milled grills – are Bang & Olufsen tuned speakers. Unsurprisingly they’re notably lacking in bass. It’s not a machine for everyone. Those with a bag full of accessories they want to keep using will likely find the need for USB-C adapters too frustrating, while pixel-addicts or those who like to navigate with their fingers are both out of luck with the Spectre’s non-touch, FHD screen. Still, priced from R29 999 as it goes up for sale, it’s quite clearly taking on Apple’s MacBook Pro with Retina display and doing so competitively. Style-starved Windows fans take note. Tech enthusiast at heart. Lover of all things digital. Papi is the founder of SA Vibe and has been sharing his love for gadgetry since 2010. Papi sees no need for wearable tech in his busy schedule and considers the Xbox One as non existant. He may come across as bias at times, and still holds a grudge at BlackBerry for creating the 8520.